Copyright © 2002 - 2013 All Rights Reserved. DJ Sharad is a house hold name within New York’s South entertainment community. His legendary “All Star” Parties in the 90’s and early 2000’s brought thousands of twenty somethings together to dance to his classic DJ sets consisting of Hip Hop, Dancehall, Classics, currents and of course his signature blend of Urban Desityle of music. In the mid 2000’s he created a series of now classic mix tapes which took the world by storm. Many of the artists he featured on his mixes went on to become platinum global artists selling millions of records and performing around the world. His mix tapes, ear for music, and knowledge of global culture has kept him touring and playing events around the globe for the past 2 decades. Along with maintaining an active DJ schedule, DJ Sharad is responsible for the direction and growth of DJUSA. DJUSA is A DJ agency and production company he co-founded and still actively maintains his CEO position. His client list is made up of some of the biggest brands in the world and includes Adidas, Footlocker, New Balance, Remy Martin, Cadillac, The Grammy Awards, and The Global Spin Awards to name a few. DJ Sharad is here to push the culture and keep moving forward. DJ Sharad has been inspired by a new generation of artists, producers, creators, and visionaries from around the globe who are making incredible music influenced by the subcontinent and true to both his loves the DESI and the HIP HOP cultures. DJ Sharad continues to be the bridge between the Desi and Hip Hop community and will continue to push boundaries with every release. Subscribe for our newsletter We will keep you up-to-date with our newsletter. No Events Scheduled. Book DJ Sharad Today! DJ Sharad's 2018 Press Kit. DJ Sharad's new mixtape American Born Certified Desi gets featured! DJ SHARAD x DESI HIP HOP , The best Desi Hip Hop mix featuring the best South Asian artists from around the globe. "Their Indian-fused hip-hop ... lends Subcontinental style to the traditionally American rhythms." 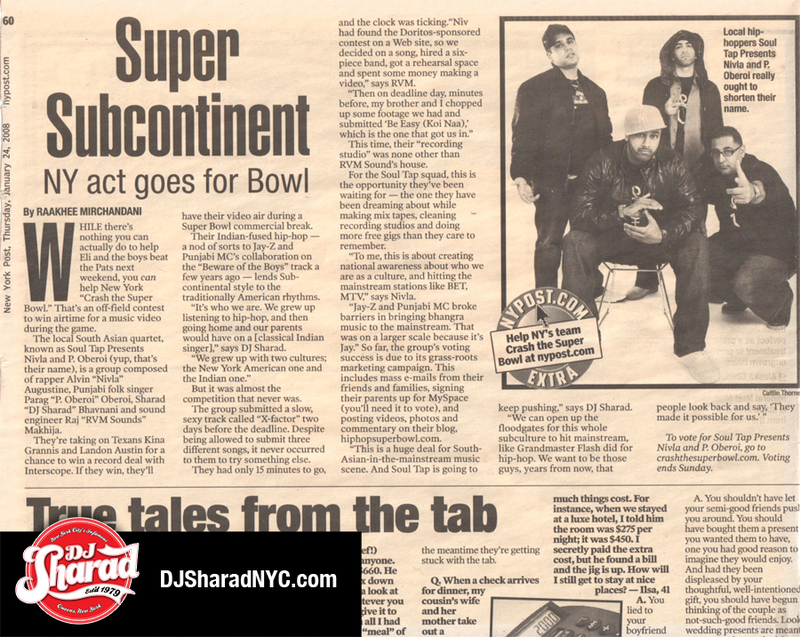 Desi Club interviews DJ Sharad, circa 2004.